This is a white boutique wrapped bow with 1.5" grosgrain ribbon on a French Clip. A large chocolate brown Velvet Gerbera Daisy sits on top attached to it's own alligator clip. 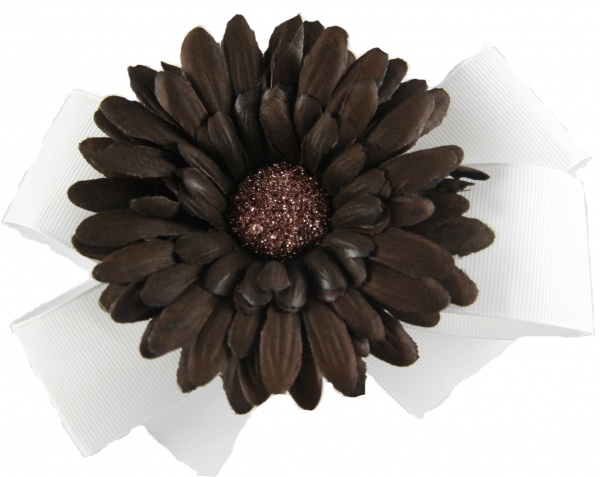 The daisy is 3.75" in circumference and has a brown sparkly center. Both pieces can be worn separately too, just slide the daisy off and the bow has a white flat center so it can look great alone too. I am currently out of the brown flower, this white bow can have any other flowers on this web site added to the top instead.